The client had a poorly performing, external website whose design & user experience did not mirror the client’s values or the needs of their target audience. 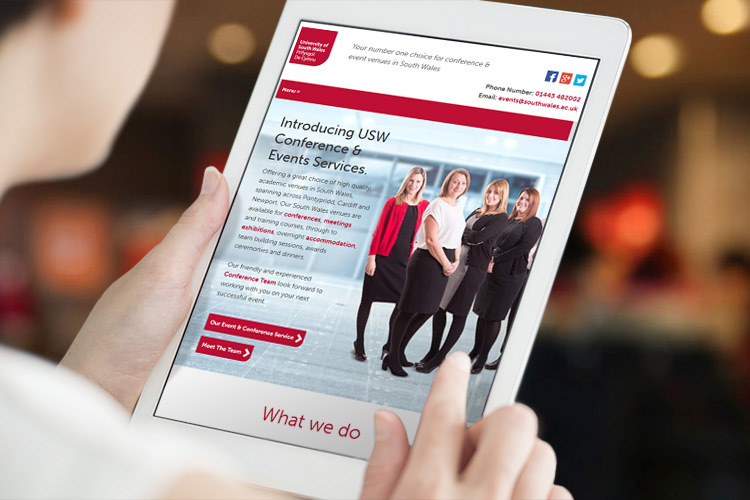 We used our trust and trusted process to analyse the existing site and to plan for a structure and a user experience which would resonate with the target audience; and giving them the confidence that USW could handle the conference & events requirements. Extensive help and advice was provided in planning and creating website content so that it would be as effective as possible to website visitors. “When we first approached the Glass Mountains team we had an idea of how we wanted our new website to look, the finished article, however, far exceeded our expectations and still does! They made the whole process from start to finish, dare I say, enjoyable – getting us to really concentrate on what we and our clients needed from the site. Passionate about the role they play, they challenged our way of thinking and came up with fresh ideas to ensure we got the most out of the process, without the usual jargon and over-sell. The end website was fully responsive, and bespoke designed based on a custom build of the WordPress publishing platform. Full training was provided. Visit the UoSW Conference Services website.